Donations to legal teams that help reunite children and parents separated by heartless border control agents (who are just following orders, of course) can make a difference. One Facebook fundraising campaign by a pair of former Facebook employees raised $9 million in a matter of days, for example. And it can’t hurt to let our elected representative know how we feel when they stand idly by while atrocities are committed on their watch. Real change — change that minimizes the chance of this kind of thing happening again as soon as we're distracted by another shiny scandal — doesn’t come through such actions alone, however. No matter how much money private individuals raise for worthy causes, the resources at the federal government’s disposal are vastly greater. For every pro bono lawyer valiantly fighting for justice, the president can muster a dozen of the highest paid mercenaries. He can also stack the courts with compliant judges with only a passing familiarity with the Constitution or the laws that are supposed to implement the principles embedded therein. And he can pretend to ignore every unfavorable ruling as fake justice, just as he ignores every fact-checked callout of his latest lies as fake news. As for the Senate and Congress, when was the last time their members voted in accordance with the will of the people? The National Firearms Association represents a small fraction of the population but has most of Congress in its pocket, even though a vast majority of the country opposes a lengthy list of NRA positions, even after the folly of those positions are laid bare in yet another school hallway. Why should immigration policy be any different? So, sure. Keep up the pressure through the conventional channels. But if we really want to bring an end to cruelty at the hands of our government, if we really want to send a message that we’re mad as hell and we’re not going to take it anymore, we have to change the government itself. We only get to do that every second November, but at least we get a chance, and we should never take our democratic rights for granted. As Thomas Jefferson once wrote (more or less), unless we use our ability to effect genuine, radical change every once and a while, we’re spitting in the faces of those who died to give us that right. This year’s mid-term elections are the time for such change. November may feel like a long ways off. But it’s not too early to start making politics a part of the daily conservation with have with our friends and neighbors. (I’d say family, too, but I know how difficult that can be these days.) The message I will be bringing to those conversations is that the only way to effectively communicate our disgust is to vote against every candidate for every office who has not condemned Donald Trump and the Republican Party for its inhumane treatment of certain members of our species. 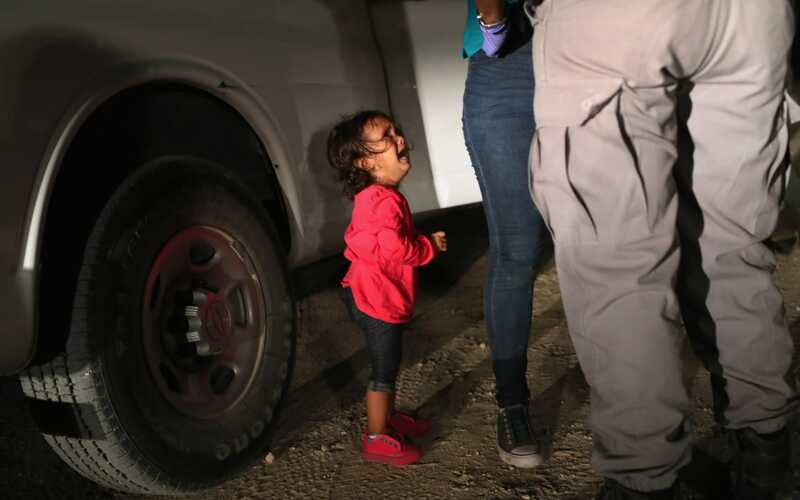 You don’t have to be a devout Christian to know that you’re not supposed to consign “the least of these brothers and sisters” to wire cages for the crime of fleeing tyranny. That doesn’t necessarily mean voting against every Republican, but it does mean voting against any Republican who isn’t waging war on his or her party’s leadership — aggressively and publicly — over this issue. In other words, if a GOP candidate isn't fighting for the soul of his or her party, then they don't have much of a soul of their own left, at least, not one worth your support. You might have to do some research, but it’s not hard to find out if your elected representatives have dared to stray far enough from the fold to display real courage. I called Rep. Patrick McHenry’s office to ask what he’s doing about it, and was told that, while the congressman is not at all pleased with what’s going on down on the Mexican border, he will only support legislation that comes with Trump’s full support. You can decide whether that is sufficient to meet a bare minimum moral standard. As for convincing those in your social circle who might not agree with the above polemic, here's a simple test. Anyone who thinks Rachel Maddow is putting on a show, and not sincerely upset in this clip and who sides instead with Laura Ingraham that the kids like the one in the viral photograph above are "child actors" enjoying "summer camp" is probably beyond reason, and you shouldn't waste your time.